Cool new release in the Rothmans series dedicated to soccer legends of yore. This one's dedicated to Alberto Tarantini, a bygone star about whom I know nothing, being a stupid American. 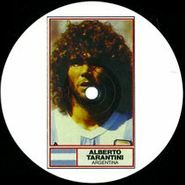 It also represents the red hot Timothy J. Fairplay's return to the label. His contribution, "The Third Season," is more of the slow acid arab sound him, Weatherall and Scott Fraser have been up to. "Horse," by Tommy Walker III, is a galloping '80s inspired number, while Max Essa's "Stereoscalpedmysexpool" is slow, sensual vintage UK acid house. Al Gobi's contribution will appeal to fan's of Young Marco's new age inspired jams.